Excellent news! With the vote tomorrow, should we contact folks on the committee to urge their support — and if so, who? 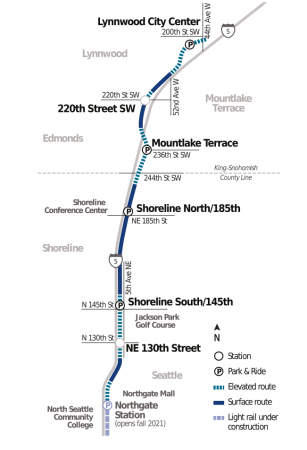 Well if added, that will leave only 1 unfunded provisional station on Lynnwood Link. As the 220th ST station would be a 20 minute walk from me vs. 25 minutes to Lynnwood, but then there is the having to cross at highway on/offramps part. So I have to ask what purposes there may be for this station. The 810 bus would probably be truncated at Lynnwood anyway, so it’s only the 871 and 405, which becomes very short without the I-5 stretch. What I could see is if Swift and/or Route 101 were to divert off of Highway 99, the 220th ST station would be the closest in the area to make that transfer. Similar to the way Community Transit is diverting the 196 a few blocks this fall to connect with the Lynnwood transit center. Doing this could pretty much replace the 871 and 405 and serve Edmonds park and ride. Right now getting between the I-5 transit centers and locations along Highway 99 by transit is a PITA. This might be the best argument for a 220th ST station. Another possibility is that 220th to 212th to Main would be the shortest, most direct route between Lynnwood Link and downtown Edmonds/Kingston ferry. Route 116 kind of does this, but to Lynnwood transit center (and onwards to points further north and east). This would also replace the 871 and 405 serving Edmonds park and ride. 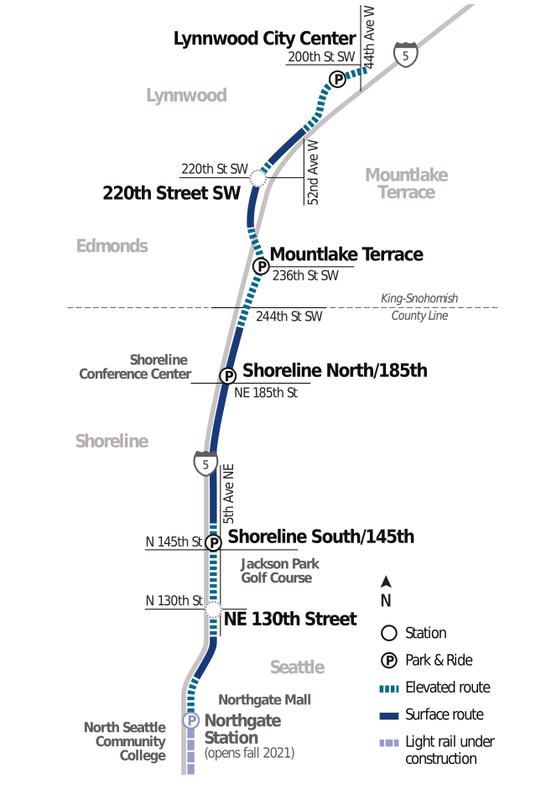 Of course, one might even argue that beefing up the 116 and going to Lynnwood is better because it runs between actual destinations not just transfers, in which case the 220th ST station really doesn’t do much. Diverting Swift for a Link connection anywhere would impose delays of up to 20 minutes for all they riders. I-5 and 99 are not that close, plus you’ve got multiple left turns to get off and on 99 again, each of which require a good two minutes, just sitting at the stoplight. CT does plan on extending Swift to connect with Link at 185th, and I think that’s sufficient. If you want to get to Link further north, take a different bus. The purpose is to get to the office parks around 220th, and the possibility of additional jobs and density in the area. Agreed – stick with the 185th St. station for Swift connection. There are some apartments close to the station, but those office parks are a bit of a hike and a bus connection would be appropriate. Right now MLT is pushing for density near the transit center, but this might change in the future, esp. if there’s going to be another light rail station. Plenty of space with the strip mall and office park parking lots. They’re talking of truncating buses at Lynnwood Transit Center, but also at Mountlake Terrace due to the crowding of buses at the former. There are also routes that make sense to truncate south of Lynnwood, such as the 416 that presently goes between downtown Edmonds and downtown Seattle. Building the station while the construction equipment is already on the ground makes so much more sense than disrupting a line that is already running with a whole new round of construction. It is great news that ST is willing to consider this. These are the best comments I’ve seen since I joined this organization, because for four comments and counting, everybody, transit related at least, is doing the best they can. Let’s do whatever we can to make this course of events last as long as possible. This time. Even if they can’t finish the station access within the available time and funding, the platform(s) should be built so that no disruption to operations will take place to add it/them later. I certainly hope that the station straddles 130th, whether elevated or in trench alongside the freeway. This is to be the primary north-end bus intercept so it should be built with access to both sides of 130th without crossing the street. The platform(s) don’t/doesn’t necessarily have to extend under/over 130th, but walkways should. The narrow right-of-way on the east side of the freeway there makes a center platform station quite desirable here. Put the platforms on the bridge, even if it means the bridge has to be widened, not across Fifth NE. Regardless of timing for the opening on 130th, it was just plain dumb of ST not to plan on something at 130th during Lynnwood Link construction to minimize or eliminate disruptions for the (then) future final construction and opening of 130th. Luckily, cooler heads might prevail and we get the best possible outcome. Yes, yes, yes. Thank you. Richard. This will be a major bus-to-rail transfer station and needs to be designed as such. 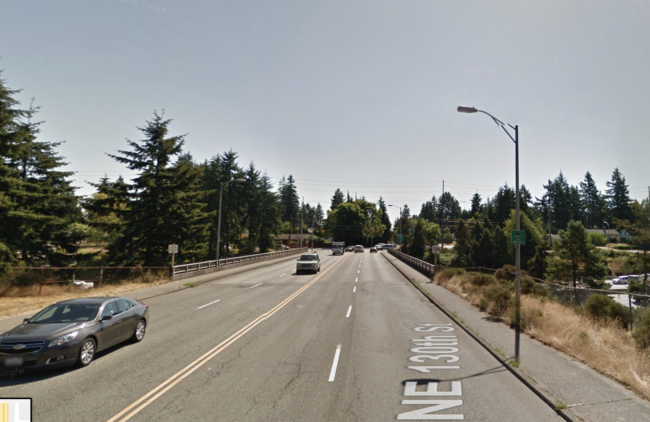 Is SDOT planning on converting 130th into a complete street? I can’t help noticing the way too skinny sidewalk, no bike lanes, but overbuilt car lanes in the picture. It’s pretty clear that the bridge will need widening. The sidewalks are way too narrow to serve as bus stops, but putting the bus stops east of Fifth NE would destroy the value of the bus-intercept. WSDOT won’t pay to widen the bridge, though, so ST or the City will have to foot the bill. Or, we could narrow the car space to just one lane per direction. Then, there’s plenty of room to fit wide sidewalks, bus stops, and bike lanes within the current footprint. It would still require curb work, but that’s much cheaper than rebuilding the entire bridge. If 130th doesn’t have I-5 access, it really doesn’t need both lanes. Even without curb work, buffered bike lanes and floating bus islands could be built on this overpass for next to nothing. I’m sorry, guys. I don’t agree that the bridge can be just two lanes, especially if buses were stopping in lane. One Thirtieth is a major connection between Northgate/Lake City and Bitter Lake and serves as a “back way” to avoid the congestion on Northgate Way/105th and 145th. WSDOT and the City would never go for it. I believe it’s probably possible to get bus lanes along the curb. So, the widening doesn’t have to be heavy structure, just support for the bus stop and a bikeway behind it. But the City will probably have to pay for it. Maybe. I don’t know what the traffic volume on 130th is. Is it any more than the other 4-lane streets that the city has converted? We aren’t about giving drivers a back way to avoid congestion. That sounds like the argument for the 99 tunnel. We’re about getting so many people to switch to transit that the streets are empty enough to convert some of them to housing or other uses. Mike, you are plenty smart enough — and reasonable enough — to understand that everything done in transportation has to be win-win. You simply cannot take a four-lane arterial, narrow it to two lanes and have buses stop in those two lanes every three to five minutes. IT. WILL. NOT. FLY. Mike, if you will be so kind as to put on your remembrance cap and wind back to 1925 in North Seattle you will notice that exactly the same street grid that exists today was there then. It was there when there were 1/25th the number of cars there are today in the Central Puget Sound Region. In fact, if you go back to Brooklyn and walk past the brownstones that the Brooklyn Bridge was built in the 1870’s to serve, you will find a street in front of every house. Benz built the first automobile in 1885; streets were a fixture in every city long before then. The fact is that people like their streets; they LOVE their streets, because it means they — or Amazon — can bring new stuff to put in their houses. There will never be more that 2% of the street mileage in Central Puget Sound converted to housing. Never. And, lastly, “we” at Seattle Transit Blog are not “giving” drivers who use 130th a back way to avoid congestion. It is not ours to give or withhold. They already have it. We did it on Dexter and part of 23rd and other places I can’t think of off the top of my head; we’re doing it now on 35th NE. Where did you get the idea that many buses were coming? This is not Jackson Street or Pine Street. There will not be dozens of peak express buses terminating here. Just the 522 and 65 on the east side and the Meridian route on the west side. I think you would have a hard time making the bridge two lanes. The freeway ramp is just west of it. Traffic builds up, waiting to turn. Not only because of oncoming traffic, but also because the ramp is metered. At a minimum, you would have to carve out a left turn lane. The problem is that a left turn lane would be fairly short, and back up onto the bridge. That could easily mean that a bus (that just wants to go straight) would be left waiting for freeway traffic to clear. It is important to remember that the main reason this stop makes sense is because the buses can get there easily. We don’t want to mess that up. No matter how the area gets rezoned, there won’t be huge numbers of walk-up riders. Most of those walk-up riders will be on the east side. There will be hardly anyone from the southeast side, because of the park. So the main thing is that there be room for a bus to stop and let off passengers. My understandng is that the rail line will be between the freeway and 5th. That is the area that will have to have the work done. If any street gets shrunk, it is 5th. It is five lanes there, which is probably three too many. At the same time, you do need a way to get from the northwest to the station. The good news is that the crossing isn’t huge there (unlike Northgate). A pedestrian bridge (that could also work for bike traffic) would probably do quite nicely. That means walk-up riders from the east cross on the north side of the bridge (which would effectively widen the existing bridge, but just for pedestrians and bikes). Buses would have stops on the west side of the bridge (for both east and westbound buses) with stairways up to the train on both sides. This isn’t cheap, but it isn’t a fortune, either (cheaper than the Northgate pedestrian bridge). It is quite possible that Seattle ST funds could cover it. If not, then the city will have to pass another transportation package (something that is likely to happen given the extra funding necessary for MoveSeattle projects). The tricky part may be figuring out a temporary funding mechanism that can kick in before Seattle comes up with the money (that is highly likely to occur — I can’t see Seattle failing to approve something like that). You could make the bridge 2-lanes if you installed a solid median, preventing westbound drivers from turning south onto I-5. I imagine eastbound numbers are quite low, since most drivers turn onto I-5 here. You know my own priority would be to extend bus-lanes (with an “only” after it!) as far north as possible. Or at least to near Northgate, to where we finally get decent minimal express bus service. Maybe we can build it for an easy transition from bus to rail. Pencil it out, and I think that, whatever it costs, we can save in operating time. And same system-wide. Bus lanes from where to where? Thanks for making me clarify, Mike. It’s been a long time since I drove, or rode, I-5 north of Northgate. Like the 512, for example. From there south, don’t the diamond lanes change directions around noon? Seems to me that if we could fix that, a few miles’ civil engineering could start to save us a lot of operating time until LINK got to Everett. And also be sure there are passengers in the habit of riding transit. Other than that…one of those things we could do so a temporary funding slash won’t be fatal. Or somehow fail to get passengers to the polls where a couple precinct’s results could get a pro-transit result between two candidates nobody likes. Doubt we’d do this very often, if at all. But never hurts to be ready when we have to handle something like re-routing the 550 through SODO at a couple weeks’ notice. Which everybody knows can never happen. The express lanes go north to Northgate. I’ve never understood why they were never extended further. The original express lanes were designed in the early 1950’s snd built in 1962. Engineers at that time only cared about getting the north enders into downtown. There was no planning ever to get people through downtown. The bottle neck at Convention Center was planned. There was no park or Convention Center at first. The park was built in the 70’s and the Convention Center in the 80’s. Also there were originally plans for the 23rd Ave freeway to take up the slack. That ended up being the I-5 crazy islands to nowhere and 520 diving boards. When the other freeway was axed, the original plans for I -5 did not work, but they were already complete. Today none of those things make sense. But in 1955 it was set up as 2 freeways. If you look at it from the misinformed engineers point of view of that time, it is amazng the Express lanes went that far north. This is wonderful news that materially increases my faith in ST leadership. Please also advocate for routing the Hwy 522 Bus Rapid Transit on 125th/130th instead of 145th. Otherwise, Lake City will forever be isolated and bypassed. We have far more density, greater concentrations of poor and elderly and people of color, so there is a Race & Social Justice consideration as well. Has anyone looked at this with data, not just politics? I agree with the Lake City routing, but think that ST has already decided to avoid Lake City in order to get their suburban constituents to the train faster. I would expect Metro to take over with a Lake City to Bitter Lake frequent crosstown bus service, either as a shuttle or more likely as components of other routes that combine to provide service on 125th/130th. The crosstown service that will serve two urban villages and connect them to the rail system is too important not to provide. Without it, the 130th station has much less reason to exist as there is very little in the way of walkshed there. I’m very heartened by this decision and agree that – should we get this station so much sooner than planned – we need to keep on Metro to accelerate planning for the services that will connect Lake City, Bitter Lake, and the rail system. My guess is that Debora Juarez has almost assuredly looked at the demographics and, if not, she’s been relatively good at answering constituents (although I disagree with her on several topics, she’s answered me in the past). You might want to reach out to her and ask. The reasoning for 145th appeared to be Seattle and Shoreline wanted a reason for someone else to pay for repaving/rechannelization. But with 130th opening early, there might be a chance to address the 522 BRT. I agree with you, skipping Lake City is dumb. 145th is because East King is paying for it, and Lake City is not important to them. If memory serves, main problem with the 522 between Lake City and Bothell is that especially northbound along the Lake, a northbound diamond lane will not only not fit on the right of way, but will have to cross a number of residential driveways. Only way to get any kind of speed would be to tunnel. Which, as Kenmore and Bothell develop, will eventually happen. One thing worth trying: Fast walk-on ferries between Kenmore and lakeside Seattle. Maybe including Fremont and Ballard via the Ship Canal. Same as with where Bothell LINK swings into I-405 LINK. Not to far from where Ballard/UW/Kirkland Bridge goes over Lake Washington. I know that tail-wagging golden retrievers provide more laughs to senior citizens next ST-whatever. But no regulation against taking them on LINK now. And if they’re properly trained, they’ll never jump over the jet-boat rail, bring back a duck, and then shake off all over you. Just be sure you post an RCW against it, at a wall-level where they can both read it and not wet on it, tempting as that is right now for passengers who read them at a higher wall-level. It makes sense to have a bus route from about 145th and Lake City Way to Greenwood and 130th. It could be extended on both ends. On the east end, it would go towards Bothell. On the west end, south on Greenwood, towards Ballard. The west end (towards Ballard) has a lot more people. An extention in that direction would likely result in much higher ridership and thus much higher frequency. Either way you can’t cover every combination. If you keep the 522 BRT as is, and then run a bus from Ballard to Bitter Lake to Lake City Way and 145th, then someone would have to transfer to get from Lake City to Kenmore. But if you extended the 522 BRT through Lake City onto Bitter Lake, then someone would have to take two buses from Lake City to Greenwood. Again, I think the better route — the one with more combinations — involves keeping the 522 BRT on 145th, and running a separate bus from Ballard to Bitter Lake and then onto Lake City Way and 145th. That isolates the more suburban 522 corridor (Bothell/Kenmore/Lake Forest Park) while putting Lake City on an urban path (more fitting for current density, let alone future density). In other words, I was bothered that the 522 BRT project skipped Lake City, but now I think Lake City can do much better. Well said. Ballard, North City and Bitter Lake have more in common with Lake City than do Kenmore and Bothell, though it probably makes sense to have a shadow route a la the CT local on Hwy 99 run from UWB to Northgate via LCW and Northgate Way. Yes, I agree, a shadow route through Lake City also makes sense. Something like the 372 could make sense. That way folks in Kenmore get a one seat ride to the Lake City, UW, etc. This is really encouraging news and boosts my faith in ST leadership as well. My faith will be fully boosted when I exit Link at 130th Street Station and board a bus heading to Lake City or Bitter Lake without having to wait in the rain to cross a busy street. Currently the land use on 3 corners of this interchange is residential and the 4th is a city park. I don’t know what the eventual land use of this area will be, but regardless, pedestrians and bicyclists ought to be able to safely approach the station from all sides. The challenge is all the vehicles using the I-5 ramps, 130th St. and 5th Ave. It should be way easier here than at 145th because of the half interchange. Seattle’s Bicycle Master Plan has a cycle track on 130th. Looking at aerials it’s very clear Roosevelt Way, the diagonal, used to go through before I-5 was constructed. West of I-5 the ROW of Roosevelt is a quiet residential street built to arterial standards, super wide. It’s a flat diagonal shortcut from the vicinity of 130th station to the whole stretch of Aurora up to 145th St. in the Bitter Lake Urban Village. That looks like a great pedestrian/bicycle opportunity. There’s also a high school tucked in there and the Interurban Trail… a lot going on a few blocks west of this station. This is encouraging news. I do have to wonder what this means for the fate of the FTA FFGA for Lynnwood Link. I certainly wouldn’t want this development to jeopardize that significant funding source by giving the FTA an excuse to delay the agreement even longer than they already have. Unlikely ST would bring this forward unless VERY confident it doesn’t affect the FFGA. After all, that was the argument in 2016 for waiting until the 2030’s to add the station. Now that ST has been in constant contact with the FTA over Lynnwood, they surely have the right assurances that adding this station won’t hurt. Does STB have anyone from ST on the record about such an “assurance”? This sounds like it could impact the opening date of the Northgate station. If so, how much longer will it be? Why? It’s all beyond the end of the Northgate Link stub track. This shouldn’t affect Northgate at all. Northgate is a totally separate project. It’s already under construction, and could only be delayed by issues during construction, testing, etc of the stations at Northgate or south. Opening day of Northgate is (tentatively) about three years out. This month we’re 2/5 through the gap between UW Station opening and U-District Station opening. Hooray. I wish it were 3/5. I wish it were 5/5. When they build Graham Street station, the only choice is a side platform station. If they build 130th as part of the new 2024 version of Lynwood Link, will they consider an island platform? It looks like side platforms are the way to go when tracks are already there. But they can easily choose both before tracks are laid. Yes, Graham St. Station. Another voter-approved station to be added…when? Anybody heard anything about Graham Street Station? Good news! It will better news when Board approves. Best news of all when I see open houses. Keeping an eye on you, ST.
We can’t deliver the pizza to your house. We’ll actually drop it off 3 miles away from where you live. But get this … We can actually deliver it 15 minutes sooner than we said we could! Isn’t that great news? And this is a propos of what? While they’re advancing 130th early, Snohomish County politicians should be advocating to deliver Everett Link in at least two parts, with the first being from Lynnwood Transit Center to 128th/Mariner Park & Ride, where riders can connect to/from the Swift BRT Green line to/from Paine Field/Boeing-Everett and Mill Creek. This segment could be up and running by the late 2020s, a benefit to many of today’s commuters while shifting the platoon of buses to/from Everett north of Lynnwood Transit Center for their turnaround.